We've been hearing that OnePlus intends to launch a second smartphone this year for quite a while now. Hints and leaks have suggested that it will be less of a hardware monster, but will have a shinier design, appealing to casual users who like to have a good-looking smartphone. Well, the latest leak, which allegedly comes from sources in partner factories, reveals that the phone would be dubbed the OnePlus X. And, instead of packing midranger hardware, it will have the flagship specs of yesteryear. Namely, the alleged OnePlus X, will rock a Qualcomm Snapdragon 801 under its hood. Additionally, the leaksters said that the display diagonal would be 5", contrasting the phablet-class 5.5" size of the OnePlus 2. Design-wise, the phone should also differ from what we've seen so far. The OnePlus 2 does look quite a bit like its predecessor, and the OnePlus X should break that trend. Renders show the device sporting a smooth, possibly metal back, with the fingerprint sensor moved next to the camera module, instead of sitting on the front, like on the OnePlus 2. Whether or not those renders show the final design, however, is unknown. 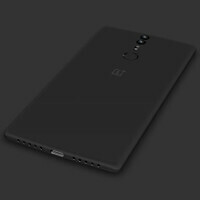 As far as launch date goes, the leakster reiterated earlier rumors – the OnePlus X should be revealed some time this October. The rumored price-tag is $249 – quite alluring. Of course, whether the phone will be readily available, or sold through the infamous invite system is yet unknown. If we had to guess, we'd have to say that it will go through invites – same as any OnePlus handset. How can there be a "flagship" when hardly anyone has ever heard of the brand? Hardly anyone? I believe 70% of people that like phones know the brand. Correct but far from being the majority. Oneplus is unknown to the usual consumer. Ppl ony know this just because first their phone had cyanogenmod.. that is why some usa ppl like omg woow.. If it wud have their own or chinese os ui nobody wud be interested in this phone..
You have to be really specific when you say that. There's a substantial difference between people who merely like phones, which I'm assuming would be anyone that has one; and someone who is a true techie or merely has a passing interest. I highly doubt the average consumer has ever heard of one plus, and that would be the majority of the market. And even then, it's not like we can really gauge awareness of their brand anyway because it isn't like that kind of information is available somewhere. So it's pure conjecture either way. If by 'like' you mean phone nerd (which I'm assuming you do the others don't count) then I'd say 100% know who OnePlus is. Otherwise, you're just like everybody else. In that case, I already know what kind of (i)phone you have. Just release a real flagship without the invitation-stuff and the best specs the market has ever seen - is it really that hard? For them it is because their profit margins are razor thin. The invite system was created in an effort to avoid something like what happened with Amazon and their fire phone. Overestimating demand and overstocking phones would have been extremely costly. But between that invite system and the extreme delays, I'm pretty sure one plus shot itself in the foot. With the moto X pure/style and Nexus 5x on the market now, they aren't really unique anymore. Too many people don't understand that the invite system servers a strong purpose for OnePlus. I don't begrudge them the use of it. The problem I have is that they allow people to jump the line by spamming their friends. When invites first opened I got in around 15k, but because I refuse to annoy everyone I know I'm now around 166k. That line is only for invites that aren't claimed, so it doesn't really matter. Wow now thats a good looking phone. Looks decent. I wouldn't call the 801 a flagship processor by 2015 standards though. The headline specifically says "old flagship specs." As in, not a flagship anymore. Launch a new phone in October when they have not even fulfilled all the 1+2 orders yet because they can't handle the amount of orders. Hmm, makes sense!